As many of you know, our youth group takes a trip every spring break to a small community of Lakeshore, Ms. We stay at a church, Lakeshore Baptist, that has been coordinating rebuilding efforts ever since Hurricane Katrina. The church is one mile north of the Gulf of Mexico and the church property was hit by a surge of water that was 40′ deep. Obviously every building was destroyed. The church holds services in a metal quonset hut and all the volunteers sleep in quonset huts made of heavy canvas. Volunteers come from all over the country to help. If you go to rebuildlakeshore.com, you will see listings every month and be amazed at how many churches send servants and how they come from all over the United States. Trinity Baptist (our church) has been to the area five times. We were there last month, the week before Easter. The same week there was a group from New York and a group from Michigan. There were close to 150 people there that week. From Trinity we had 31 youth and 12 adults. We drove four 15-passenger vans. It is about a 19 hour trip with several stops. The slide show is a compilation of pictures taken during the week we were there. The music that accompanies the slide show is meaningful because it was written by one of the youth on the trip. Another of the youth wrote and performed the music and added the vocals. 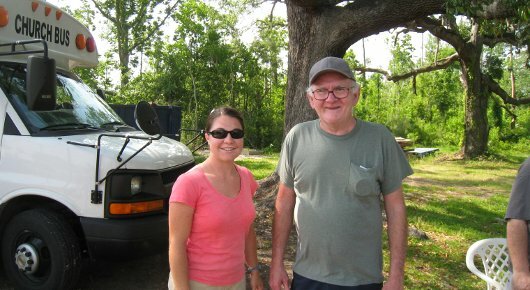 John – his home was destroyed and his insurance would not cover it so he and his wife and baby lived with his parents. The house we were working in is one that John was able to buy out of foreclosure. It had been damaged by flooding. Earlier volunteers had helped gut the house and cleanse it. While we were there we installed insulation, moved some leftover lumber and unloaded the drywall. There came a point in time where we couldn’t keep everyone busy. The kids really want to contribute while they are there, so we try hard to always have work for them. Since we didn’t, they volunteered to walk around the neighborhood, knock on doors and pray with folks – don’t ever let anyone tell you that youth today are no good. God is still in control and there will always be a remnant of believers to carry on his work. Dry Walling – several in our group did a tremendous amount of dry walling. The family had lost their home and were living in a trailer provided by MEMA (Mississippi Emergency Management Agency.) The trailer was to be removed shortly so it was imperative to finish the home. When the kids who will live in the house saw how much work had been accomplished, they were very excited. Landscaping – This home has been moved back into, but needed some finishing touches. Several in our group painted, cleaned and landscaped. The owner was very grateful. Miss B – Miss B is the wife of James who is one of the members of Lakeshore who devotes full time to coordinating building efforts for those we serve. Their home was completely destroyed. They initially built a garage and lived in that until they were able to recently complete their home. One afternoon several of us went to James’ and Miss B’s house to finish a deck. Miss B shared with the kids the trauma of going through the storm and losing their home and how she never lost faith in God. Miss B. has a handicapped sister and she refused to leave town without her sister. They finally made arrangements and were able to leave before the major damage hit. Recently Miss B. had a heart attack and while recovering in the hospital she was on oxygen. Something went wrong and did damage to her eye. She had very poor eyesight in her other eye so she was nearly blind and unable to see “yet God is good” she kept on saying. She has had some surgery and we found out later in the week that her original bad eye was gaining sight. One of the young ladies in our group had us all gather around Miss B and prayed for her. Shay Dahl – We had helped Mr. Dahl last year. He has many animals on his property, some which he owned before the hurricane and several that he has rescued and cared for. The kids wanted to go see Shay (and his animals) so we stopped in to see him after stopping at Walmart to buy some dog food. When the teens went into Walmart, the greeter asked them if they were volunteers and she shook each ones’ hand and started crying after thanking them for coming to help restore their community. When 43 people go into a Pizza Hut all at once it’s kind of noticeable and possibly annoying to the other customers. It didn’t take long though for the patrons to figure out that we were from out of state and had come to help. Some people near my table asked where we were from and where we were staying. They were very thankful and told me that it means so much to them that people are still coming to help out after so much time has passed. This year was the first year that we were at Lakeshore on a Sunday and we were blessed to worship with the members of the church. This is a small community of believers, only 25 or 30, which makes it even more incredible to see how God has used this as an assembly point for thousands of people from all over the country to come and volunteer. Although there is much work to be done, Pastor Don does not want anyone working on Sunday. As a result, we were able to go to New Orleans in the afternoon. It is less than an hour away. We also went to the beach on Wed. evening for a bonfire and on Thursday morning for a time of worship. I was able to capture some nice moon photos as well as some good sunrise photos. It is amazing to stand on the beach and take in the beauty of the water lapping up against the shore and the moon and sun reflecting on the water…then to remember that it was this same body of water that wrought destruction on the Gulf just a few years ago. 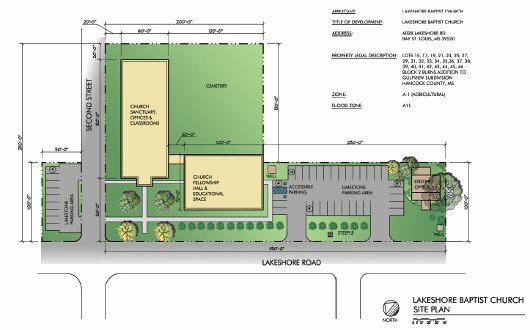 Please pray for Pastor Don and his team and also pray for the people who are serving God at Lakeshore and in other places. In this video, Don Carson, Tim Keller and John Piper discuss the potential disparity between mercy ministry and proclamation ministry. In other words, how do you keep compassion from sweeping away evangelism? They hit the nail on the head when they insist that the safeguard rests in the clear proclamation of the gospel, not the pulling back from mercy ministry. We must hold fast to the reality of sin as offence to God, Christ’s substitutionary atonement for sinners, and justification by grace alone. from Disaster Relief Evangelism – Don A. Elbourne Jr. I am greatly encouraged by the ministries of Don Carson, Tim Keller, and John Piper and praise God for their clarity in this short video. May their words serve us well in Lakeshore.